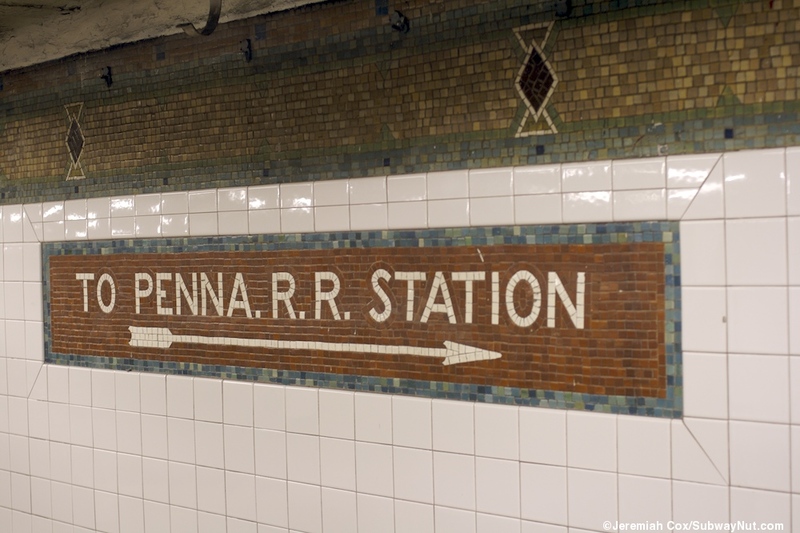 34th Street-Penn Station on the IRT was the first subway station to serve the Pennsyvalina's Railroad's Station and Monument to Transportation that opened in 1910. 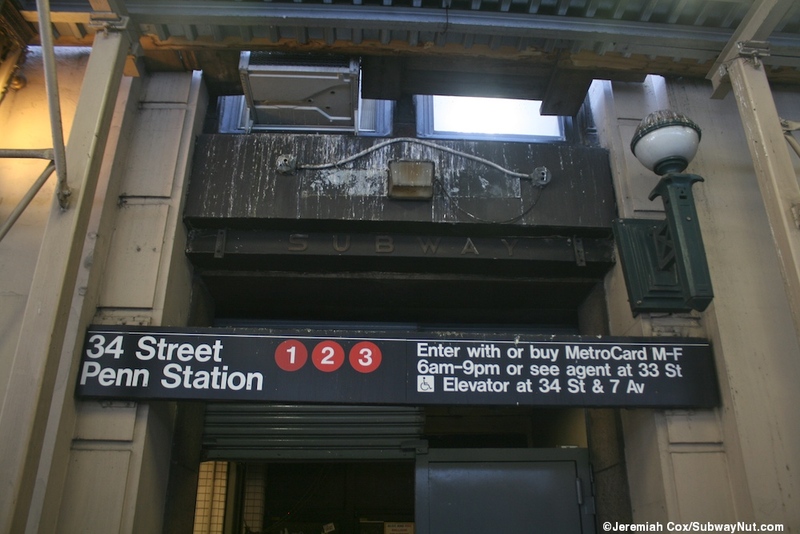 It took direct subway service 7 years to finally arrive when the station opened on June 3, 1917. 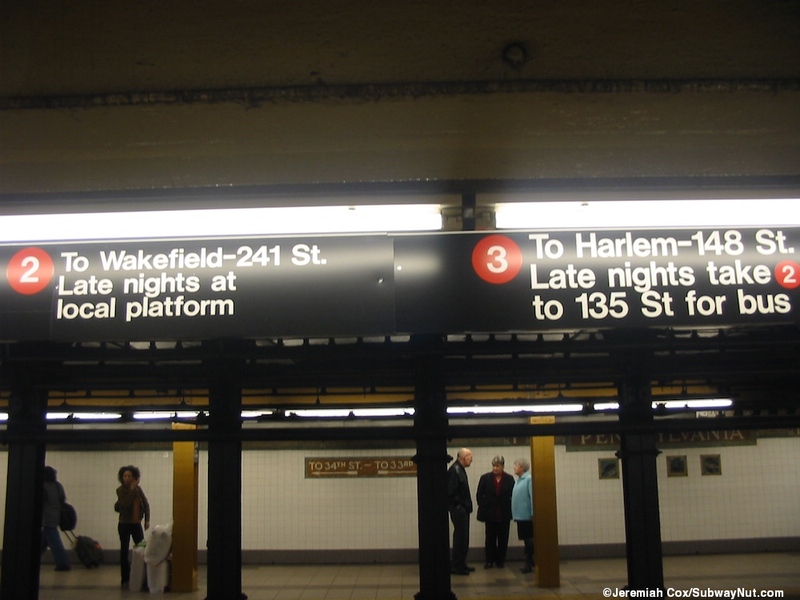 At first service was provided by a Shuttle Train to Times Square where passengers transferred to then only local service along the original IRT route. 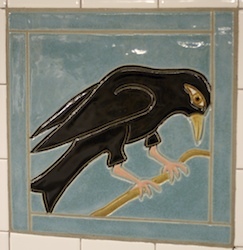 On July 2, 1918 the station became an intermediate stop on what were then trains running from Times Square only to South Ferry, continuous service to Bronx came a month with the opening of the H-System on August 2, 1918 which introduced IRT service pretty much as it is today. Our tour will begin a the southern end of the station. A narrow underpass connects all three platforms. This has one staircase down from the Express Platform at about the 2nd car from the southernmost end of that platform (the platforms are offset). The Uptown local platform has a very short passageway beyond the end of it. 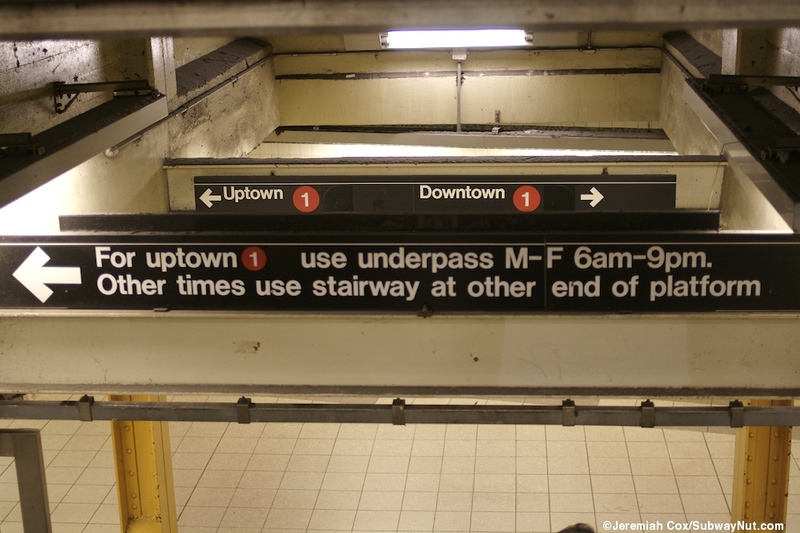 This leads to two staircases down to the underpass and an exit only open Monday-Friday from 6am to 9pm (signs claim the underpass to the uptown local platform is only open during these hours as well, the gates are there but this is no longer true). 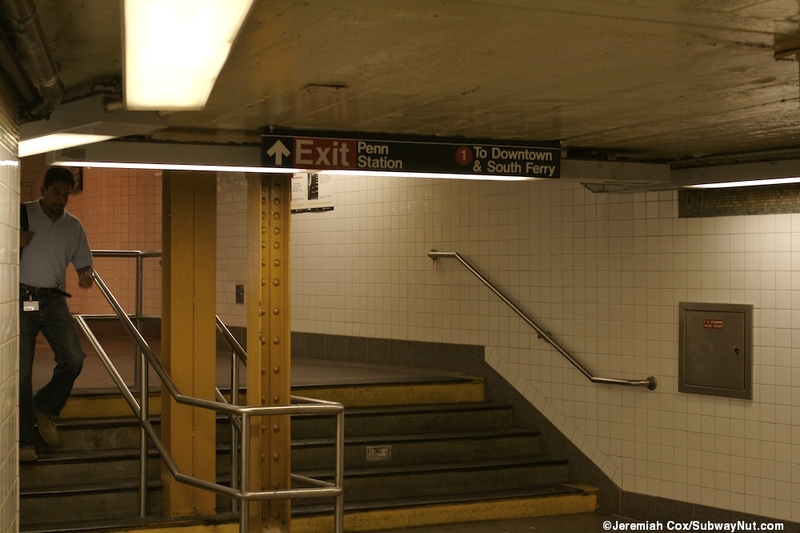 This exit has turnstiles at the same level as the platform and a walkway leads through a underground corridor clearly controlled by a building and up to the north side 32nd Street with a door into and a view of glass to Little Italy Pizza that will put tables at upper landing by the entrance to the subway. A storefront gate and door lead out to the street. When I got off there on March 4, 2013 the gate wasn't up, just the door half open, an awkward obstacle to navigate to get on and off the subway. The next day I checked again and the gate was open with the door closed. 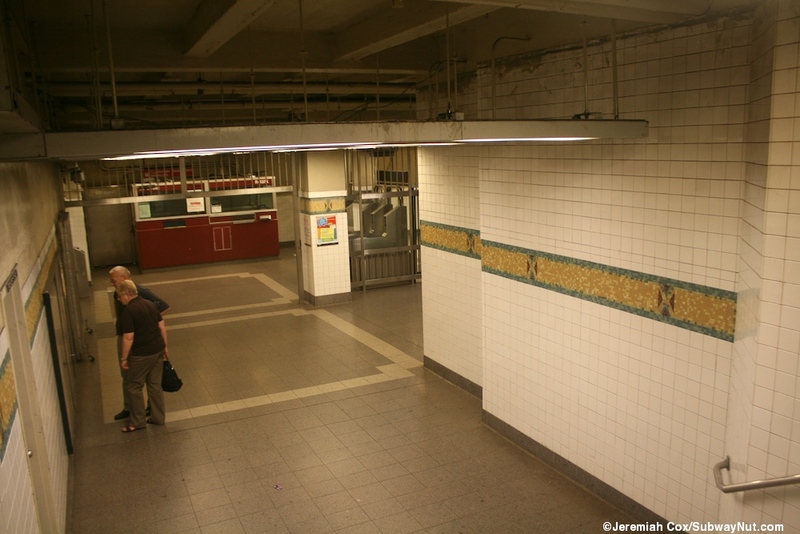 At the opposite end of the underpass, three steps lead up to a small fare control area with a high ceiling and indirect lighting that gives a tiny taste of how grand the original Penn Station was before it was demolished to make way for Madison Square Garden. 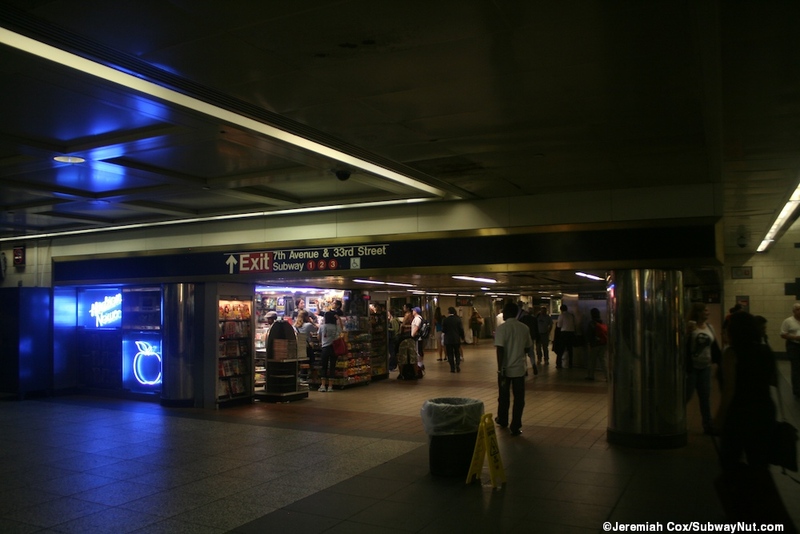 The turnstiles lead out to a token booth with limited hours and an entrance into the Hilton Passageway next to the Tracks Raw Bar and Grill (that reaches a block underground all the way to the main LIRR ticket office, that's there main entrance) on the lower level of Penn Station. It is right near an entrance to the New Jersey Transit Concourse and a great exit to use to those trains as well as a less hectic corridor to reach Amtrak farther down the relatively empty passageway compared to the hectic main entrance at the northern edge of the train station. The remains of railroad's past is here with a painted sign that says Penn RR Trains. 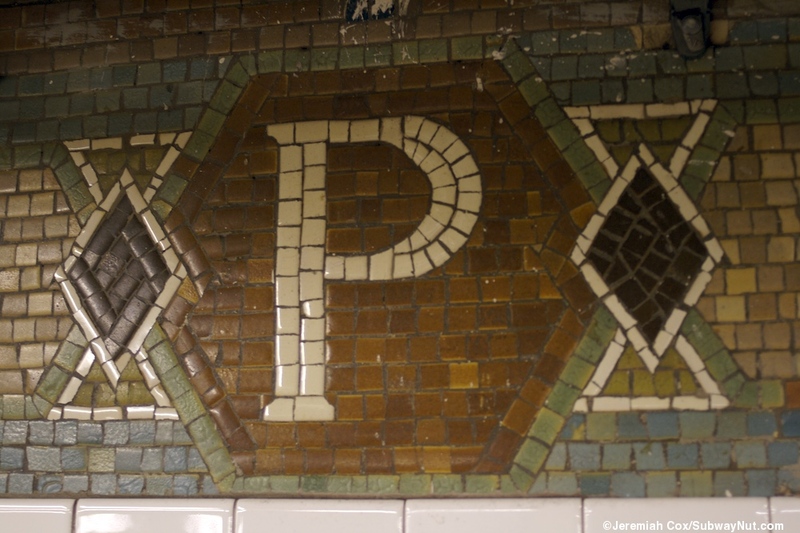 The staircase up to the downtown local platform is the relic of the original Penn Station. It leads up to the level of the platform at a small, blue boarded up balcony with some glass and a door that once led to somewhere. The balcony has silver railings with X's in them that date to the era of the original, grand Penn Station. A yellow arch with 'IRT Subway' still lettered above it finally leads out to the downtown platform. 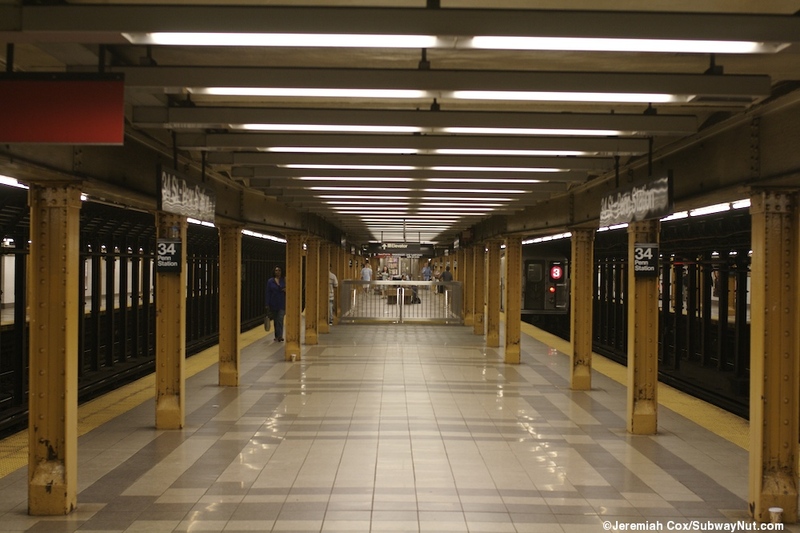 The middle of the platforms beneath 33rd Street is where the main entrance as well as platform elevator entrance to Penn Station is. 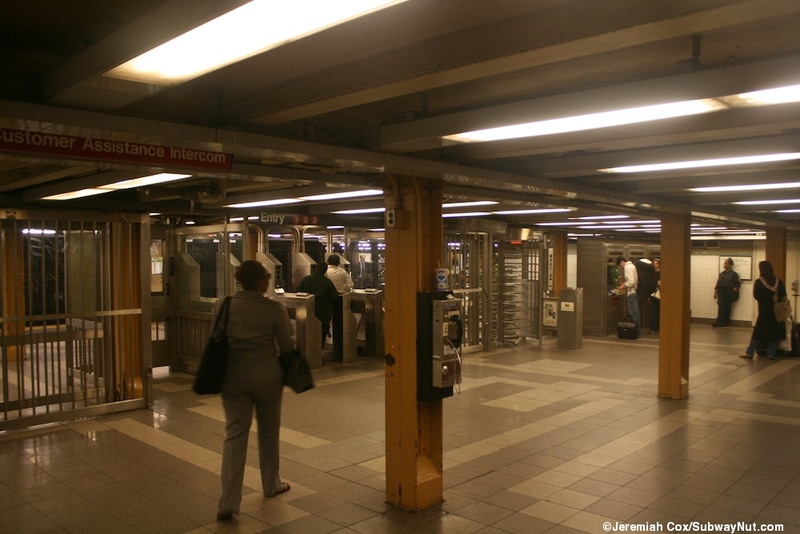 This is at two large banks of subterranean turnstiles and the 24-hour token booth located directly beneath the subway platforms. 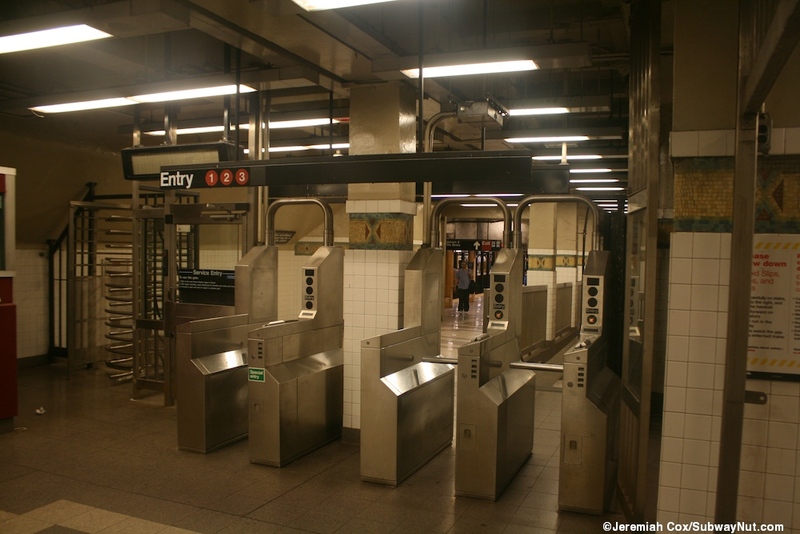 These turnstiles lead to the eastern end of the Main Connecting Concourse and nearby is a passageway that leads one block north, underground to the one entrance to Penn Station at 34th Street with escalators and the main LIRR elevator that is the accessible route into the subway station as well (the subway station lacks its own elevator). There is even an LIRR train departures display within fare control. 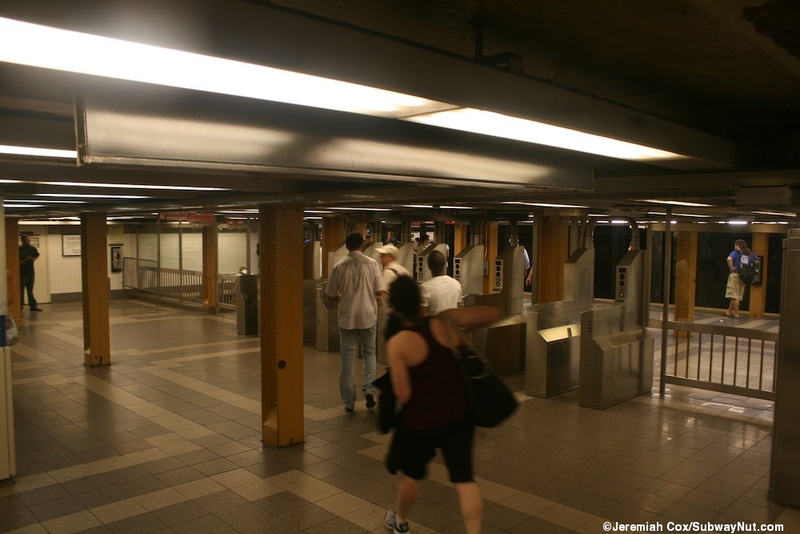 Beyond the turnstiles are two staircases and an elevator to the island express platform, two staircases and an elevator lead up to the Downtown platform right next to a High Entrance/Exit turnstile that leads up to a single normal streetstair at the NW corner of 33rd Street. 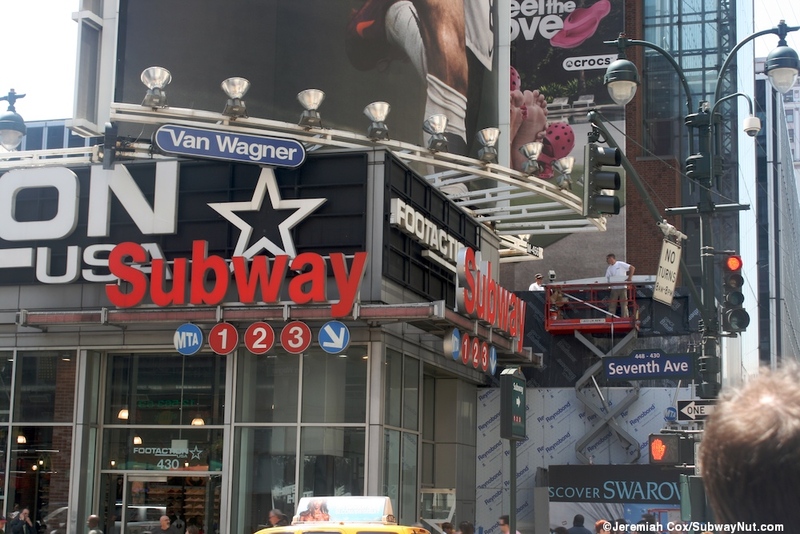 This street stair is beneath Penn Plaza and includes an illuminated sign hanging from that building for the subway with the bullets 1,2,3 beneath it. 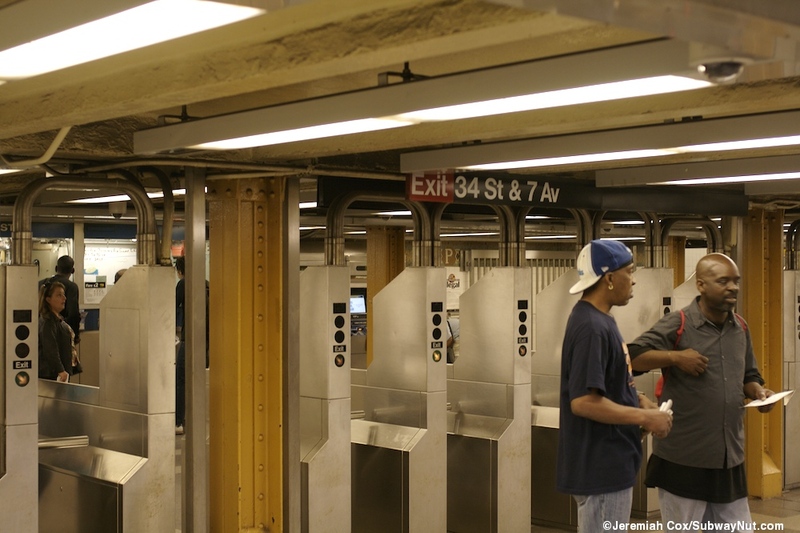 A narrow staircase within fare control (that has a short intermediate landing before curving) with a glass divider separating it from a much wider staircase outside of fare control in its lower-half plus an elevator (within fare control) lead up to the Uptown platform. Here is a much wider secondary fare control (and passengers accessing Penn Station from uptown trains have an easier time using this fare control area compared to the one beneath the platforms). This fare control area has its own turnstiles plus two regular exits. One leads up through a short corridor inside a building to the Southside of 33rd Street just east of 7th Avenue. 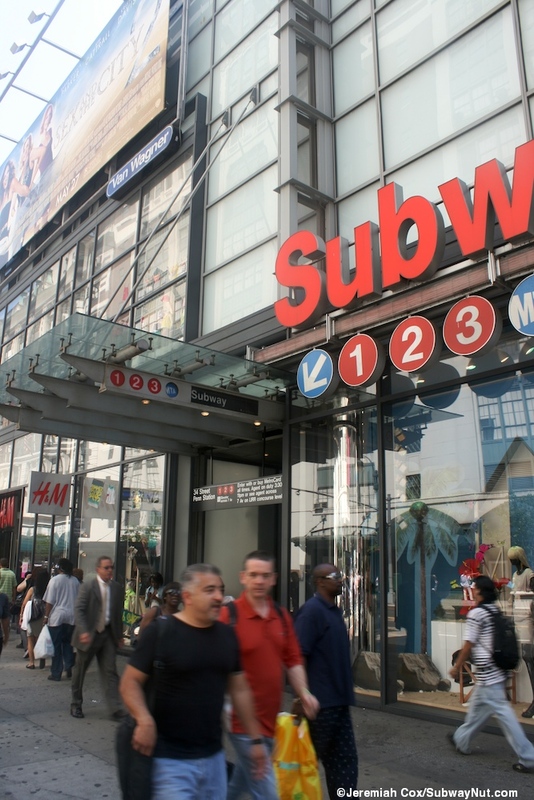 At the street this exit is next to Little Italy Pizza and its cafe tables stretch into the vestibule entrance to the subway station. A normal streetstair leads to the NE corner of 33rd Street 7th Avenue. This though is along a Sbarro's Pizzeria who's two level dining room stretches underground with a window into the subway station. Passengers at this station can access three pizza places without going outside and this is not including The bottom of this streetstair includes a fenced off abandoned newsstand and a dirty staircase with a chain across it that says subway entrance closed. The northern end of the platform has two fare control areas on the local platforms visible across from each other because the slightly south offset express platform has ended at a staircase down to a simple underpass with one staircase up to each of the local platforms. These fare control areas both have regular turnstiles with removed token booths. 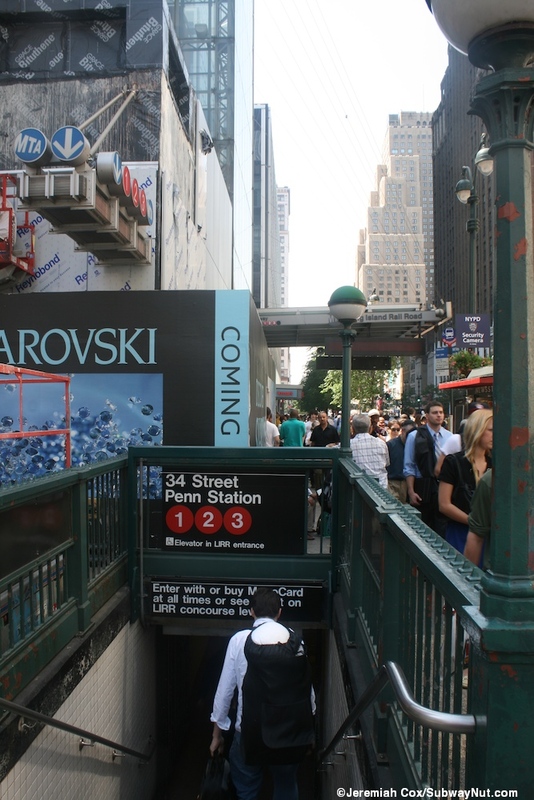 The downtown platform has a single streetstair up to the NW and SW corners of 34th Street and 7th Avenue. 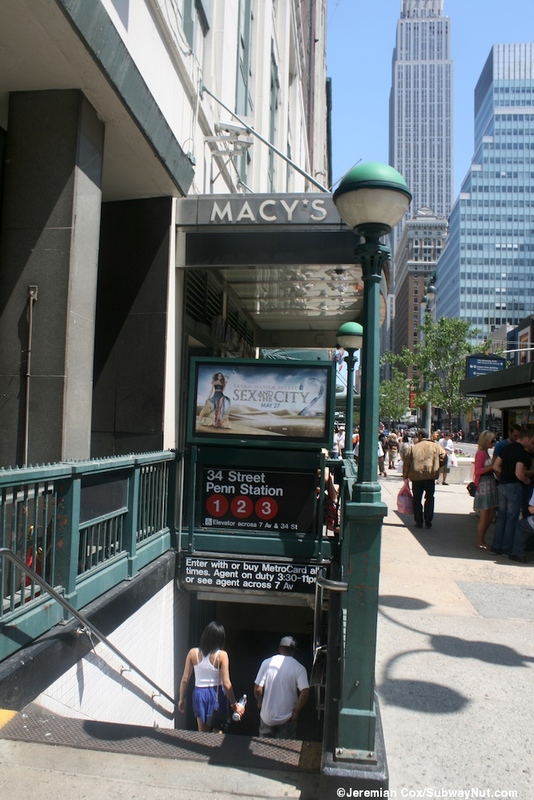 The downtown has exits to a streetstair up to the NE corner (in front of a corner of Macy's) and the SE corner is in a storefront along 7th Avenue next to H&M with a glass canopy. 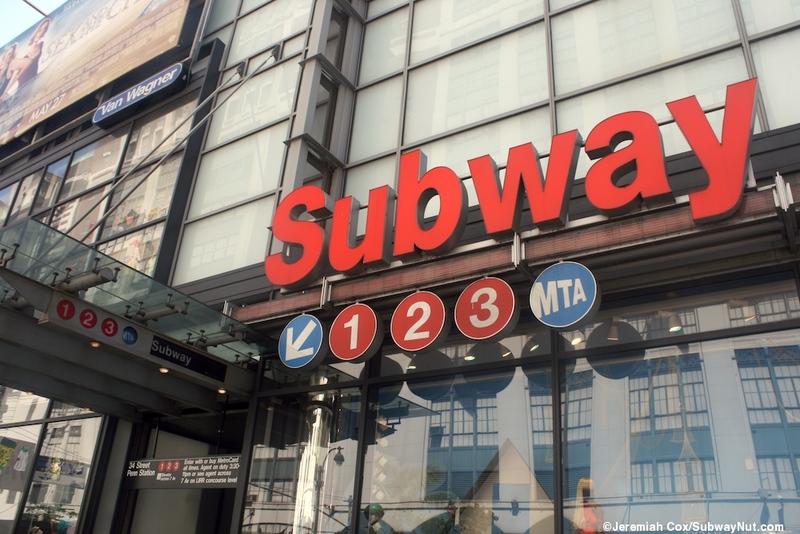 The entrances from the south side of the street both have illuminated subway signs next to the exits identical to those at the downtown platform's 33rd Street entrance. 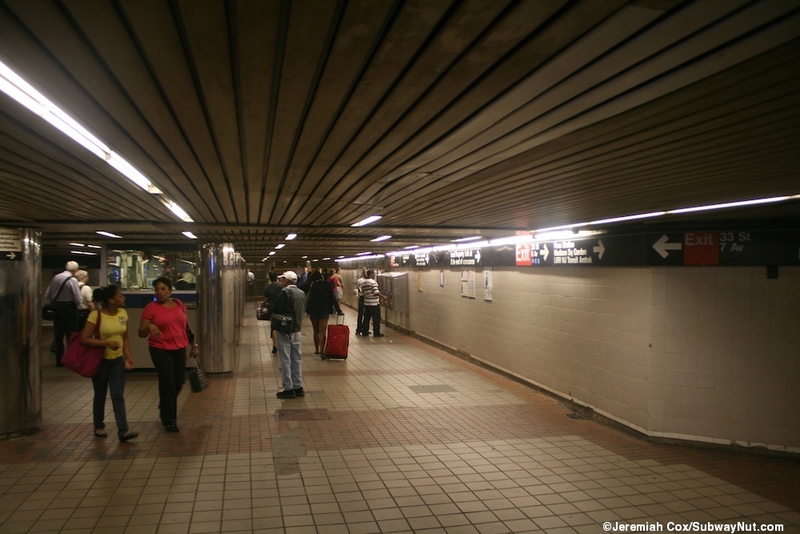 The SW corner entrance is a short-ways away from the wide Penn Station entrance to the LIRR concourse from 34th Street with the closest subway elevator for ADA access to the IRT platforms and escalators. 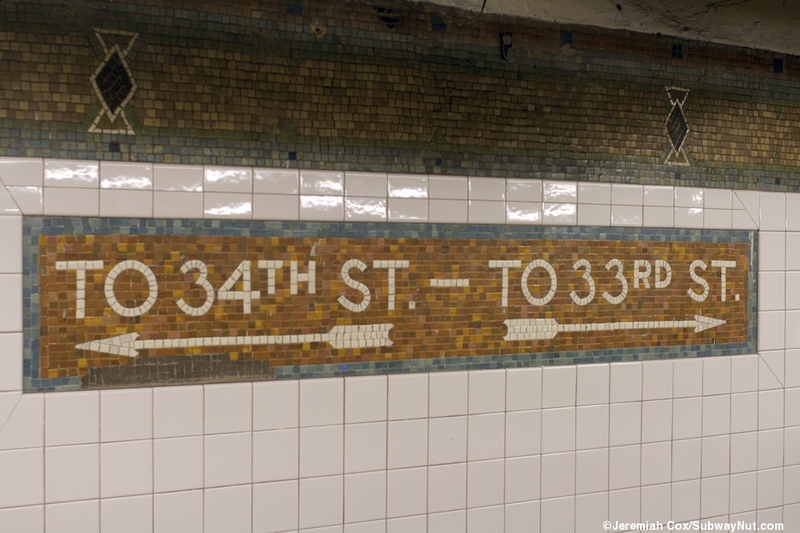 34th St or 33rd St mosaic?